Do you own a firearm for personal protection? If so then you should definitely have a safe to protect those firearms from thieves or unauthorized use when not being carried or used by you. Do you own those firearms for personal protection? If the answer is “yes” you might also want to consider purchasing a bed side safe as a means of keeping at least one of those firearms close at hand while you are at your most vulnerable. Selecting a safe is no easy task, especially for the new gun owner. There are dozens of models available in various sizes, shapes and methods of operation. Furthermore, what may make for an excellent wall safe or under the bed safe might do be desirable in a bed side version. Bed side safes are not generally designed for storage of multiple firearms; instead they are intended to store one or two personal protection weapons close at hand while you are sleeping. This means this type of safe is usually much smaller than other home safes, about the size of a large lock box. However, it is important to make sure the model you select is big enough to accommodate the various firearms you may wish to use for home defense and, if possible, extra magazines or a flashlight so that everything you need to respond to an emergency is in one place. Because of their small size bed side safes are far more portable than other safes, meaning they are also far more susceptible to themselves being stolen if not properly secured. 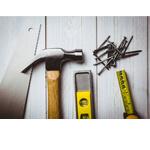 There are a variety of methods in which small safes can be secured including being mounted to the floor , wall or furniture and attached to a heavy stationary object via a steel cable. Some models may even be concealed to further deter detection. Each design has its own advantages/disadvantages which must be weighed against your personal needs. Probably the most important consideration when it comes to bed side safes is the ease in which it can be accessed. If you are storing a firearm close at hand for the purpose of personal protection the hope is you will never need to use it. However, if you ever do find yourself in need of your firearms the last thing you want is for the locking mechanism to defeat you instead of an intruder. 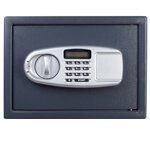 Today’s safes are available with a variety of locking mechanisms including biometric, electronic combination (keypad), traditional combination and key operated. Biometric and electronic combination models are much faster, especially under stress. Traditional combination and key operated are slower but almost fool proof, especially since there is no power supply needed. 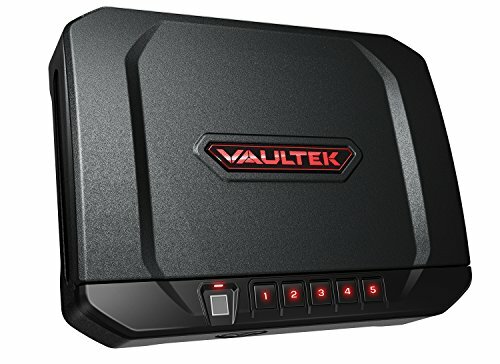 The Vaultek VT20i is a high tech. personal gun safe designed to place your firearms at your fingertips- literally. The built in fingerprint scanner features a high resolution sensor designed to allow instantaneous access. Do you have other family members who may require access? Not a problem as the VT20 is able to be programmed for multiple users. But don’t worry not only will unauthorized users be unable to gain access, their attempts will be recorded and reported with the VAULTEK app for Android or iOS. Access is also possible via the backlit keypad, key entry or even remotely by using your smartphone. The safe itself is constructed of durable 16 gauge steel with interior mounted, pry resistant hinges which cannot be breached from the outside. For added protection the case includes anti-impact latches and a protective powder coasted finish which is available in several colors. At 11.5”x5.75”x2.0” the VT20 is big enough to store a variety of single handgun, yet small enough to be stowed in a drawer or under small furniture. Although this safe is designed to be portable the makers understand there are time you want it to stay where you put it so they have included mounting hardware and a steel security cable. Multiple operating systems for easy opening. Capable of being programmed for multiple users. Companion smartphone app allows remote control as well as review of status (including access log). Requires power source for most major features. High tech features, including app, require smartphone and advanced comfort level. 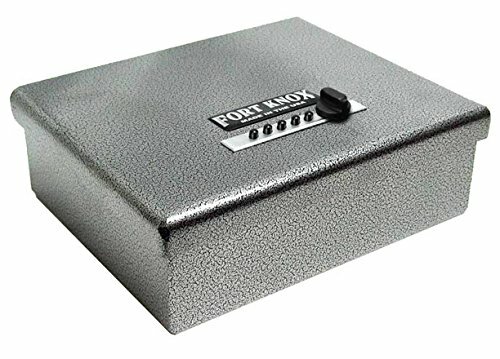 With a name like Fort Know you expect security and reliability and this pistol box does not disappoint. The simple design may not look like much but it provides some of the best and easiest to use bedside firearms protection available. The 10 gauge steel body, wrap around door and welded & concealed continuous hinge provide top of the line intrusion protection. The top and bottom cushion lining will also protect your firearms from being damaged while inside the safe. A silver powder coating protects the safe itself from damage if dropped or otherwise abused during transportation. Access is provided via a simple, reliable mechanical push button combination. With over 1,081 possible combinations this safe will be easy for YOU to open while remaining nearly impossible to hack. The gas door struts assist you in gaining carefree access by making the heavier than normal door a breeze to move. With an interior dimension of 3”x10.5”x9” this safe is small enough to be discreetly stowed out of sight, yet large enough to accommodate most handguns and extra magazines. The included mounting hardware is all you will need to secure the safe, and your firearms, from possible thieves. Very secure- wrap around lid provides extra protection from prying. Easy to use push button operation. Not the most aesthetic design available – looks like a safe. This safe is specifically designed to store a single loaded firearm at your fingertips and your bedside. The design is unique in that it does not mount near your bed but actually attaches to the bedframe itself. You cannot have your firearm any closer or more accessible. Constructed of impact resistant polycarbonate the exterior case is lightweight yet nearly indestructible. The included mounting bracket secures the box next to your bed’s mattress/box spring & the steel security cable attaches to the frame itself. The interior dimensions (10.75”x8.5”x2.5”) is perfectly suited to allow storage of most modern handguns .22 to .45 caliber. The inside mounted barrel rod positions your handgun for easy, ready to use access without damaging the firearm or exterior mounted accessories. Access is provided via a biometric fingerprint sensor, able to be programed for up to 10 users. Each user is also able to program is unique 8 digit digital combination as an alternate means of entry. Should the A/C power supply be lost biometric data is safely stored by means of the battery powered backup. Manual operation is also possible via the rear key lock. For added piece of mind the onboard memory retains history of the last 15 uses and also provides notification of unauthorized attempts to access. Biometric operation is fastest means of entry when under stress. Clamshell design and barrel rod places firearm immediately available. Can only be mounted in a single manner. Power source a must, key operation requires safe to be removed from mounting.